Was in the mood of having something spicy and soupy. 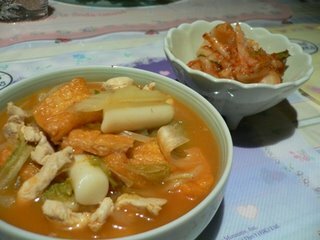 Yep, another Korean food for the night. 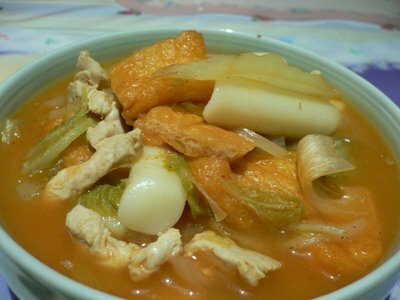 Rice Cake In Spicy Soup (Ddeok Bok Ee). The unique tube shape of the rice cake attracted me to grab them off the freezer immediately. And the tau pok a.k.a Korean fried beancurd tastes the same as our SG tau pok. Now I know where I can get tau pok whenever I miss them especially eating Laksa. Yum! Originally, the recipe uses just spicy power and chilli paste, but I added some soya bean paste to enhance the flavour alittle, else it would be too bland yet too spicy.